A rural B-school in rural Maharashtra, designed for unlettered women, has been drawing international attention. Nearly three years after its inception, Mann Deshi Udyogini (MDU) a business school founded by Chetna Gala Sinha, a Yale University World Fellow, with a $17,500 grant from HSBC is ready to expand. 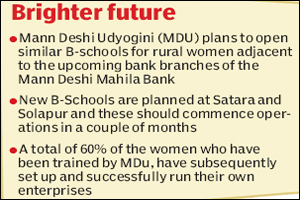 MDU plans to open similar B-schools for rural women adjacent to the upcoming bank branches of the Mann Deshi Mahila Bank. The bank has recently received RBIs approval to expand its operations and the focus will now be on opening up such schools in areas where the bank operates, Sinha said. The Mann Deshi Mahila Sahakari Bank, which currently has three branches, will soon expand its network to six districts Satara, Sangli, Solapur, Ratnagiri, Kolhapur and Pune. New B-Schools are planned at Satara and Solapur and these should commence operations in a couple of months, said Rekha Kulkarni, chief executive officer, Mann Deshi Mahila Bank. The B-school was started in Mhaswad by the Mann Deshi Foundation, an NGO associated with the Mann Deshi Mahila Sahakari Bank. With four brancheslocated in Mhaswad, Vaduj, Dahiwadi and Lonand in Maharashtra and Hubli in Karnataka it also has two vans which operate as mobile B-schools. Gala hopes to take the B-school module beyond just Maharashtra to places in Karnataka and Gujarat. Since its inception in January 2007, MDU has trained 9,000 women in business development. A total of 60% of the women who have been trained, have subsequently set up and successfully run their own enterprises. In terms of financial impact, the income of business school graduates has increased from Rs 25-35 to Rs 65-75 per day, Sinha adds. Mann Deshi has worked with sheep and goat herders, tea sellers, daily wage laborers, and homemakers. The school also coaches women in entrepreneurship by training them in accountancy, bank finance, marketing skills and teaching them to run independent enterprises as vegetable vendors, screen printers, bag makers and photographers. Currently, the school runs around 17-odd courses and the focus this year is on teaching women basic computer skills, food processing and personality development, Kulkarni said. Interestingly, the school has been attracting international B Schools. Every year, the school receives 40 odd students from international business schools including the Harvard Business School, Yale University, John Hopkins University and MIT. Students spend time at Mhasawad, working on impact assessment projects and understanding the psyche of rural Indian woman entrepreneur. Students from MIT helped the school design pushcarts for women vegetable vendors, while the John Hopkins University is doing an impact assessment on financial literacy. This year, MDU has begun the Hazaron Deshi Udyojika, an initiative that aims to train over a 1,000 women and help them become entrepreneurs. The grant from HSBC, coupled with funds from the Deshpande Foundation of the US and the Bonita Trust of the UK, helps run the school. In the next three years, the goal is reach 17,000 districts. The bank also plans to issue e-cards to its account holders. The plastic credit cards will display womens names and photographs, utilising microchip technology to store financial information. The cards instantly allow the banks agents to view the savings account balance, loan account status and repayment history. In the pilot project to be run at Mhasawade, the bank will issue cards to 3,000 account holders.